Cycling legend Phil O'Shea was known as 'The Champion'. He was born in Ashburton in 1889. 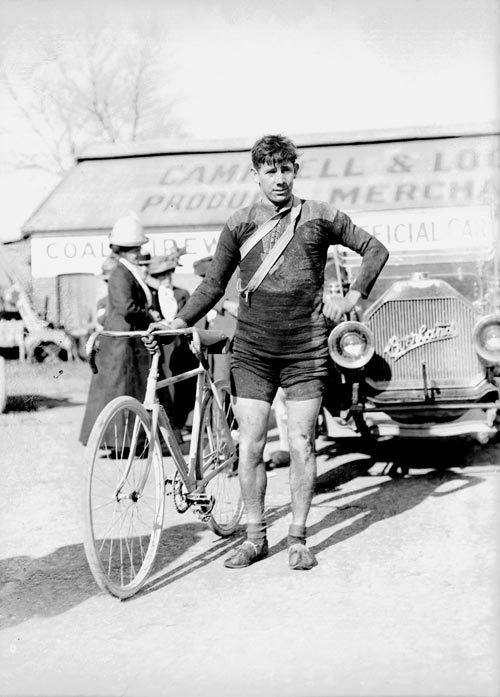 At age 19 he began his cycling career and in 1911 won his first Timaru-to-Christchurch race. He went on to win five others in record-breaking times. O'Shea also competed successfully in Australia, winning the Melbourne-to-Warrnambool Classic three times. He rode as a despatch cyclist during the First World War until being gassed. He returned to cycling following his recovery, winning several big races before retiring from road racing in 1923. O'Shea then took up professional (cash) track cycling and won every New Zealand title. He retired from track racing at the age of 40, after which he became a coach and race official for another 50 years. He is shown here in 1911.